Our Children's Worship Bulletins are jam-packed with fun and engaging pictures, mazes, codes or other puzzles. Each biblically based Bible study's puzzle and activity is designed for kids ages 3-6 and ages 7-12. Familiar Scripture passages from the Old Testament, the Gospels and the Epistles are used to create bulletins with puzzles that kids love. In this short article, we've included two examples of Sunday school games about giving that have been adapted from our Children's Worship Bulletins. This is just one creative way that you can adapt the bulletins to make Bible study fun for your kids! Print the "Take of the first fruits of the land and put them in a basket" page from the Children's Worship Bulletin for each child. Acquire 5 red apples and 5 green apples (to be given to a red team and a green team). Acquire 2 spoons (soup-sized spoons work best). Acquire 2 baskets large enough to hold all the apples. Select small prizes for the winning team. Direct the children, "The first fruits shown in the picture on the 'Take of the first fruits of the land and put them in a basket' page includes red and green apples. We're going to divide up into 2 teams; 1 red apple team and 1 green apple team. Each team is going to fill their basket with the first fruits." Explain the object of the game, "The first team to fill their basket with its complete harvest wins." Set up the teams as follows, "Line the children up in a single file line. Give the last child in the line the 5 apples and a spoon to keep nearby. Place the empty basket about 20 feet from the first person in line." Direct the children as follows, "The person at the end of the line is going to hand the apple to the person in front of him along with the spoon. Continue handing the apple and the spoon up the line until it reaches the first person in line. The first person in line must then take the apple, place it on the spoon and carefully carry it to the basket without dropping it. Once the apple is safely in the basket, the first person in line will take the spoon to the person at the end of the line as quickly as they can. The last person in line will begin to hand a 2nd apple up the line along with the spoon. Continue moving the fruit into the basket until all 5 pieces of fruit are in the basket. If you drop the spoon or the fruit, you have to start over with that piece of fruit at the end of the line." Read aloud Deuteronomy 26:1-11 to reinforce the lesson. Allow the children to finish coloring their activity bulletin together. Print the "Give thanks to the Lord for all He has given to you" page from the Children's Worship Bulletin. Divide the class into 2 teams. Direct the teams as follows, "The first fruits shown in the picture on the 'Give thanks to the Lord for all He has given to you' page includes corn, apple, banana, orange, tomato, eggplant and carrot images. Let's name other foods that the Israelites might have grown" (Answers: any grain, fruit or vegetable). Explain the object of the game. "The goal is to be the team to name the most grains, fruits or vegetables." Yell, "GO!" and document each team's contribution. When done, count each team's contributions to determine the winning team. Complete the activity and color the page. Simplify efforts to put together Sunday school activities each week for your kids. 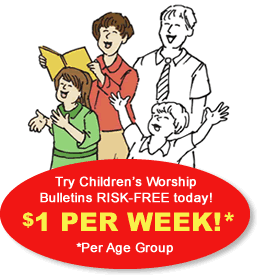 To see the multitude of Children's Worship Bulletins available, sign up for our 30-day, no obligation Risk-Free trial. 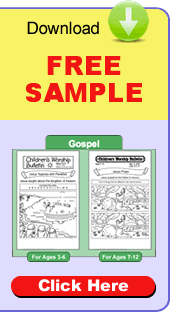 You'll be able to download, print and share Children's Worship Bulletins about giving or any other topic, Scripture reference or date related to a particular search. Our bulletins are available for kids ages 3-6 and ages 7-12. If you're not completely convinced that Children's Worship Bulletins will meet your Sunday school's creative needs, simply cancel and owe nothing. If, on the other hand, you find exactly the activity you need, purchase a membership for $12.95 per quarter per age group to continue enjoying all our bulletins! New members can enjoy a SAVINGS of 50% on the second age group for the first year of membership. Sign up today!